Run, leap, and fly through the DC Universe at no charge. Making an MMO that can compete with World of Warcraft is tough, but Sony Online Entertainment is giving it its best shot. 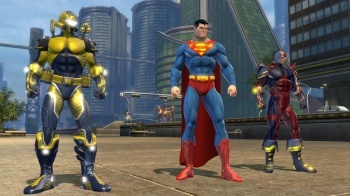 DC Universe Online which launched to stellar sales in January, will be losing its monthly fee next month. Instead, the game will switch to a "freemium" model, where players can pay a variety of fees - or nothing at all - depending on what services and content they want. While players will have access to the game's basic content - character creation, quests, inventory, etc. - for free, more invested players might find it wise to invest a little money. $5 will give a player "Premium" status, which allows them more character slots, more inventory space, and more room for new characters. "Legendary" status costs $15 a month, and gives players the maximum amount of character and inventory slots, plus access to all of the game's DLC. Free and Premium players will also be able to purchase Ã la carte DLC, while SOE will automatically transition current subscribers to "Legendary" accounts. SOE insists that this change is not due to a lack of subscribers. "This is the right business model," said Lorin Jameson, an executive producer for SOE. "If I can be honest, the game ended up costing a lot more than we thought it would, and this was our preferred business model from day one." With the right kind of player base, a free-to-play model can be more profitable than a game with a monthly fee, as in the case of games like Lord of the Rings Online. For players who liked DCUO's concept but didn't want to take the monetary plunge, next month seems like the perfect time to give it a try.